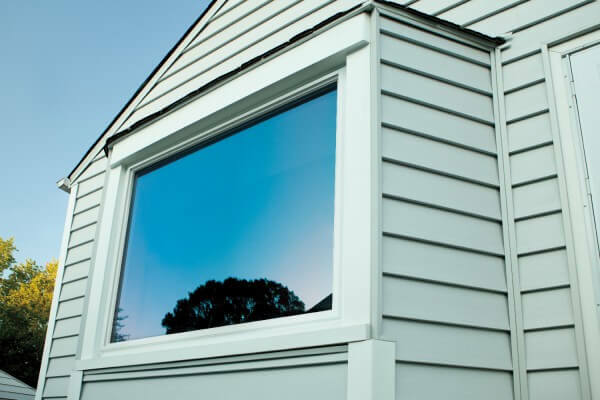 As higher heating costs and cold winters continue to become commonplace for Boston homeowners, reliable vinyl replacement window have gone from just a desire to an undeniable necessity for most households. Vinyl-clad replacement windows used to be more about style and beauty more than they were function, but those days are gone. Winters are too long, wind too strong, and energy bills to high to feel comfortable with a "builder's grade" vinyl window or older wood window. That's not to say new windows don't provide a nice visual improvement for you home. They do! But with the combination of energy savings and comfort that come with many new window lines, how great the windows look will become an afterthought to how much they improve your family's lifestyle. What brand of windows do you install? Roof Hub exclusively sells Simonton brand windows. 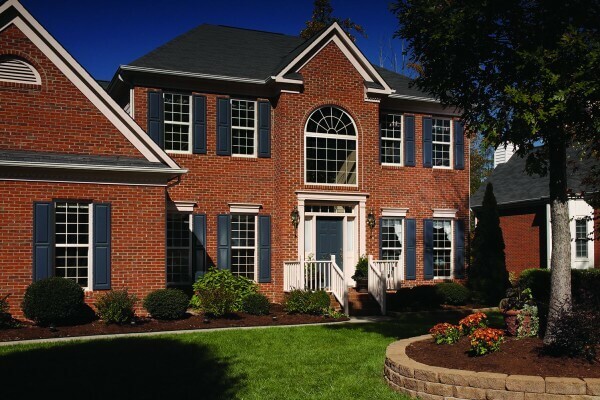 Simonton windows provide the best combination of quality and affordability for homes in the Boston area that need energy efficiency without sacrificing modern beauty and cutting-edge curb appeal. Are vinyl replacement windows energy efficient? If you have builder's grade vinyl windows or older wooden windows in your home now, then you'll certainly see a reduction in your energy bills when you switch those older windows out for vinyl replacement windows. But the question is, how much energy will you save? How low will you energy bills go? Do you heat your house with gas, electric, or oil? What are your current windows made of? Builder's grade vinyl, wood, aluminum? Our remodeling experts are trained to holistically access how all these factors will affect your yearly energy savings when you replace your windows in Boston, MA with a vinyl, energy-efficient option. Give us a call to schedule your free estimate for this week: (857) 237-7648. 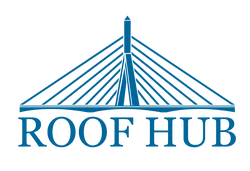 This is a great question for the Roof Hub expert who comes to your home to take measurements and give you your custom quote. Project installation length is entirely dependent on the amount of windows you're having installed, window type, time of year, and any individual requests you have. With this being said, we do our best to make installation as stress-free as possible which means we have a mutual goal to complete your project as quickly as possible without sacrificing quality of craftsmanship. What color windows do you have? We strongly advise most homeowners to choose from our traditional colors: white, tan, and driftwood. We do offer non-traditional colors, but because these windows will be in your home for decades, it's important to consider color choice as part of your long-term investment. For example, installing green windows may become an objection to buyers if you ever try to sell your house. And if you stay, they may not match the color you choose to paint your interior or exterior down the road. White or tan on the other hand, will match nearly any color scheme. How much do replacement windows in Boston cost? Pricing for window replacement in Boston varies depending on who's installing your windows, the type of window you're installing, and the warranty you're getting. On the low end, a part-time local contractor could install a Window World brand window for around $200 per single hung window. In this case, you likely won't have any warranty and the improvement for energy efficiency won't even be noticeable. On the other hand, the window companies you see on TV like New Pro, Anderson, and Pella represent the opposite end of the pricing spectrum when compared to Window World. Andersen, New Pro, and Pella pricing for window installation in the Boston area can come in at $1500+ per double hung window, depending of course how large the opening is and the style you choose. Note: for window replacement in Boston or anywhere else in New England, it's standard for more customization to cost more than less customization. This means including grids will be more expensive than no grids at all and white or tan windows will be more affordable than installing green windows. Do you repair windows in Boston? Much like our roof replacement services, Roof Hub does not offer any type of exterior remodeling repairs because we don't feel there is long-term value in these transactions for homeowners. This includes window glass replacement and window screen replacement. We want to install windows that last you decades because this way, we know you'll be happy. A much better alternative to replacing your glass or screens every few years because the root of your problems is an outdated window. 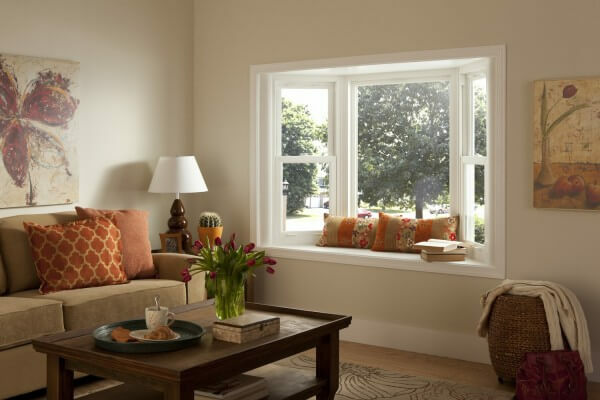 Single hung windows are the most affordable vinyl window option. They're basic in function while still allowing air in and out of your home. All single hung windows open from bottom to top, but not top to bottom. 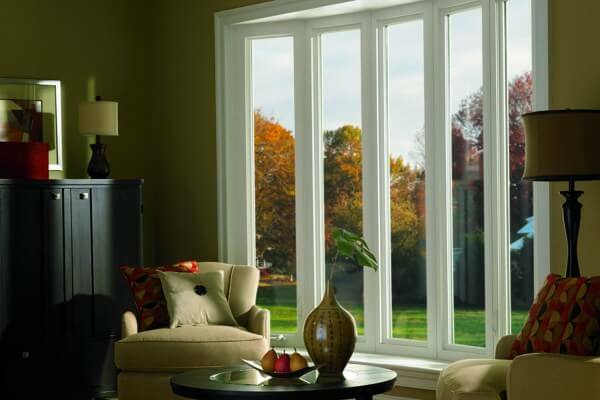 For that functionality, you'll need to consider buying double hung windows. But as far as aesthetics and curb appeal go, single and double hung windows will look the same from outside your home. Their easy tilt-to-clean features mean cleaning your windows will now take half the time. And if you'd like to open just the top half of the window to let air in, then you have that ability. That's the beauty of a double-hung. This functionality is especially helpful for keeping children safe and away from open windows. 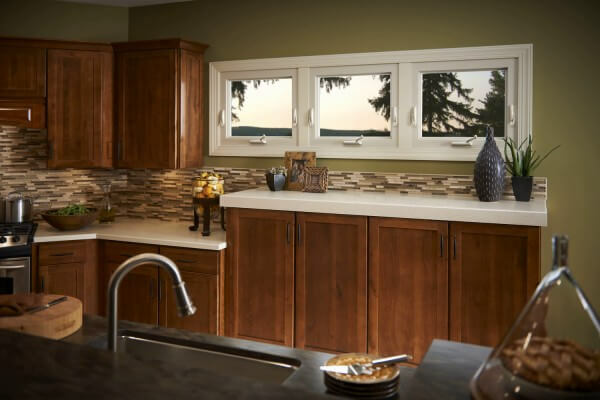 Often referred to as "crank outs," casement-style windows are popular in family rooms and kitchens because they make the entire living space feel more open. Their beautiful, open design looks great on modern homes and will greatly improve any home's energy efficiency. With less moving parts, vinyl casement replacement windows are also a very strong replacement option. Vinyl awning windows a much like casement windows, but tilted on the side. They operate on a hinge system that allows the window to swing out from the top. As pictured over the kitchen sink here, you can see how much of a space-saver awning style windows can be. Awning windows generally enter the picture when you have a space you want to be able to open and close, but isn't large enough to install a double hung or casement window. In these cases, awning windows will likely be your best fit because the only other option is a picture window (which doesn't open). Do you want to increase your living space, energy efficiency, and total home value all at the same time? If so, then you consider adding a bay or bow window to your window replacement project. Even though they come with the highest up-front cost, bay and bow windows have the best return on investment and lifestyle improvement when compared to every other style of window. This drastic improvement is especially true for older homes built in the 1950's and 1960's. Traditionally, bay windows feature a picture window sandwiched by two double hung windows. Think of it as three separate windows in one unit. How bow and bay windows differ simply boils down to appearance. Bow windows offer more customizability than bay windows and feature casements rather than two double hungs and a picture window in one unit. During your window estimate with Roof Hub, you can choose from bow windows with three, four, or five casements to fit all your design and budget needs. Sleek, modern, and clean-cut, vinyl picture windows are the epitome of "set it and forget it" if there ever was such a thing. Why? Because of their lack of functionality (they don't open and close), you don't have to worry too much about cleaning or any type of maintenance. But don't let their static appearance fool you, picture windows give big openings a truly elegant feel and provide a nice fallback for openings that can't fit a casement or double-hung style replacement window. Can't decide whether to remodel your kitchen or improve your Boston home with a window replacement project? If so, then consider installing a garden window to achieve the best of both worlds! 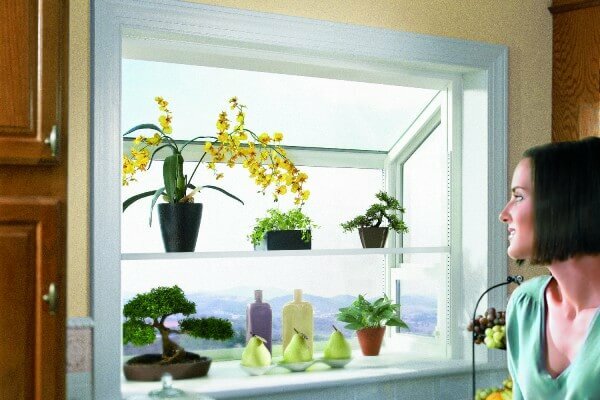 Garden windows will open up your kitchen and allow for space to keep flowers or herbs. Contact us for custom quotes on garden window installation near Boston and we'll send an expert to your home for measurements and a consultation. Are you curious what window replacement in Boston costs? Do you want to know what the styles and options you see above would look like on your home? Enter your contact information below and we'll help you get personalized answers to these questions. 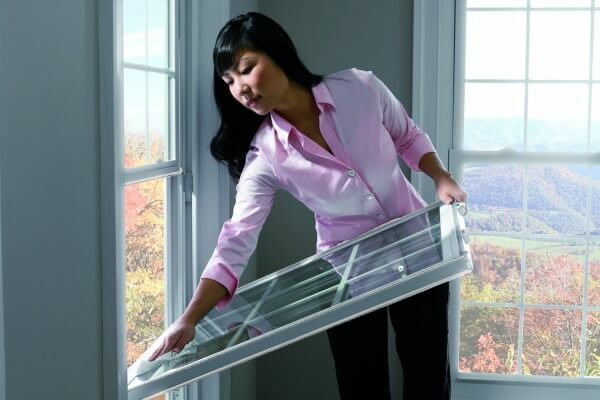 Because every home and window opening size is different, we'll schedule a time to come out to your house for a free consultation that includes measurements and a quote that's 100% guaranteed for one full year.